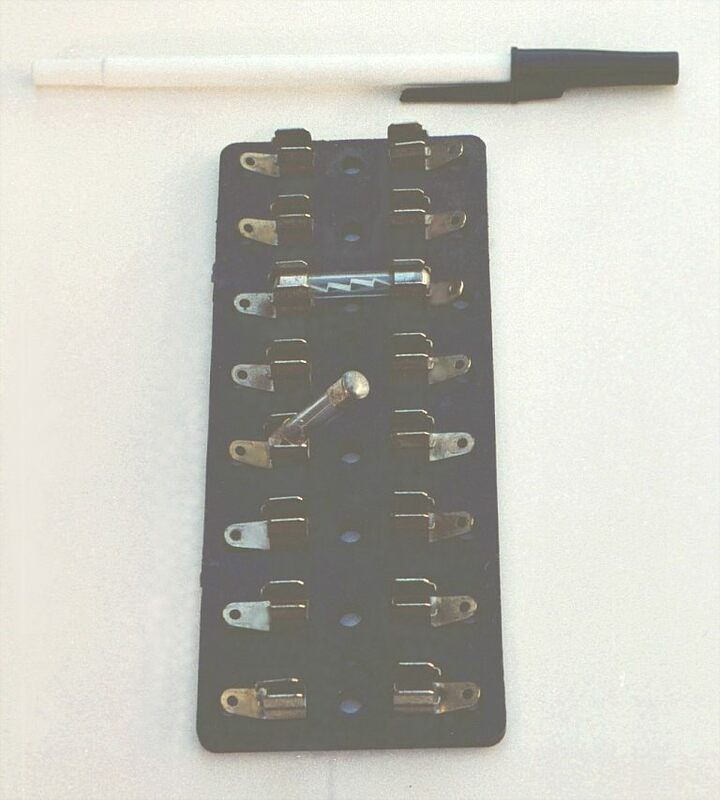 The fuses are held by spring metal clips, the clips themselves being permanently connected to the circuit conductors. The base material of the fuse holder (or fuse block as they are sometimes called) is chosen to be a good insulator. The most common device in use for overcurrent protection in high-current circuits today is the circuit breaker. Circuit breakers are specially designed switches that automatically open to stop current in the event of an overcurrent condition. Small circuit breakers, such as those used in residential, commercial and light industrial service are thermally operated. They contain a bimetallic strip (a thin strip of two metals bonded back-to-back) carrying circuit current, which bends when heated. When enough force is generated by the bimetallic strip (due to overcurrent heating of the strip), the trip mechanism is actuated and the breaker will open. Larger circuit breakers are automatically actuated by the strength of the magnetic field produced by current-carrying conductors within the breaker, or can be triggered to trip by external devices monitoring the circuit current (those devices being called protective relays). From outside appearances, it looks like nothing more than a switch. Indeed, it could be used as such. However, its true function is to operate as an overcurrent protection device. It should be noted that some automobiles use inexpensive devices known as fusible links for overcurrent protection in the battery charging circuit, due to the expense of a properly-rated fuse and holder. A fusible link is a primitive fuse, being nothing more than a short piece of rubber-insulated wire designed to melt open in the event of overcurrent, with no hard sheathing of any kind. Such crude and potentially dangerous devices are never used in industry or even residential power use, mainly due to the greater voltage and current levels encountered. As far as this author is concerned, their application even in automotive circuits is questionable. Fuses are primarily rated, as one might expect, in the unit for current: amps. Although their operation depends on the self-generation of heat under conditions of excessive current by means of the fuse's own electrical resistance, they are engineered to contribute a negligible amount of extra resistance to the circuits they protect. This is largely accomplished by making the fuse wire as short as is practically possible. 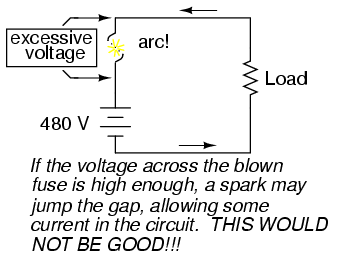 Just as a normal wire's ampacity is not related to its length (10-gauge solid copper wire will handle 40 amps of current in free air, regardless of how long or short of a piece it is), a fuse wire of certain material and gauge will blow at a certain current no matter how long it is. Since length is not a factor in current rating, the shorter it can be made, the less resistance it will have end-to-end. Consequently, fuses are rated in terms of their voltage capacity as well as the current level at which they will blow. 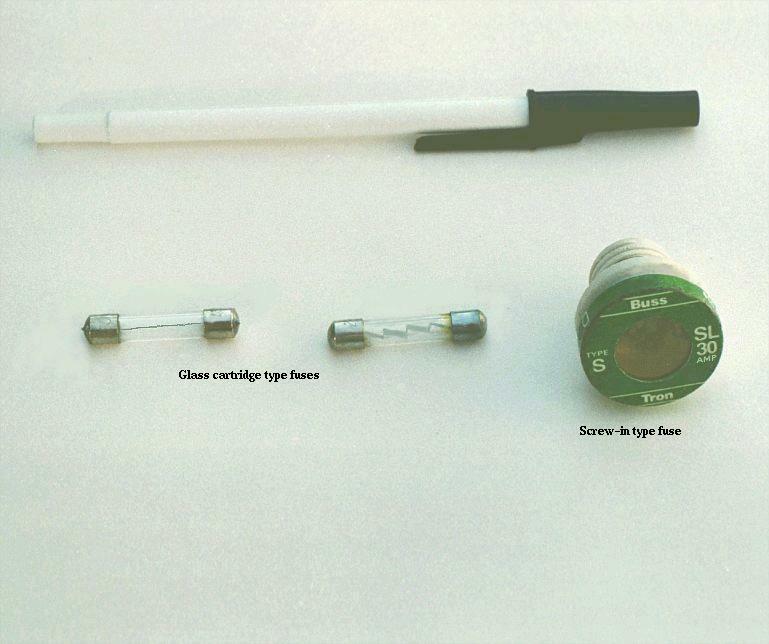 Some large industrial fuses have replaceable wire elements, to reduce the expense. 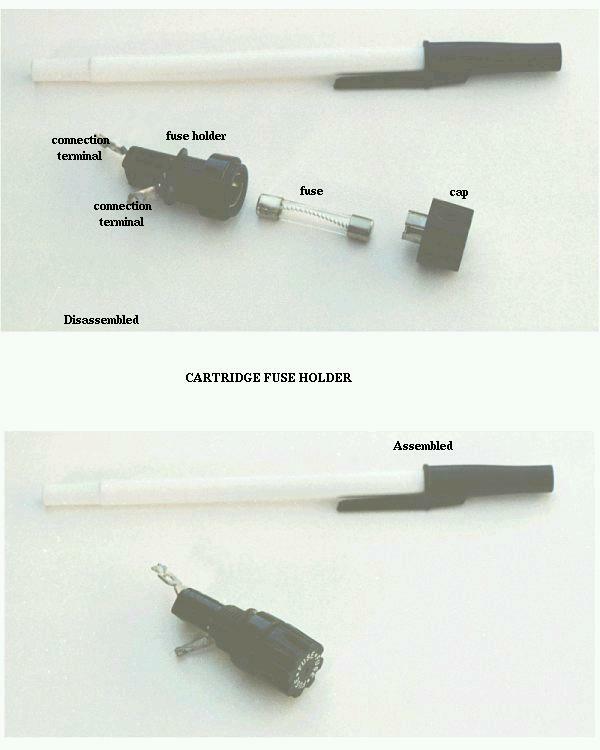 The body of the fuse is an opaque, reusable cartridge, shielding the fuse wire from exposure and shielding surrounding objects from the fuse wire. There's more to the current rating of a fuse than a single number. If a current of 35 amps is sent through a 30 amp fuse, it may blow suddenly or delay before blowing, depending on other aspects of its design. Some fuses are intended to blow very fast, while others are designed for more modest "opening" times, or even for a delayed action depending on the application. The latter fuses are sometimes called slow-blow fuses due to their intentional time-delay characteristics. A classic example of a slow-blow fuse application is in electric motor protection, where inrush currents of up to ten times normal operating current are commonly experienced every time the motor is started from a dead stop. If fast-blowing fuses were to be used in an application like this, the motor could never get started because the normal inrush current levels would blow the fuse(s) immediately! 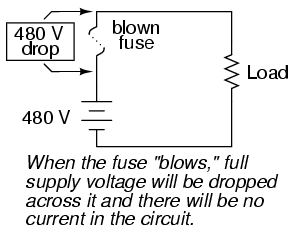 The design of a slow-blow fuse is such that the fuse element has more mass (but no more ampacity) than an equivalent fast-blow fuse, meaning that it will heat up slower (but to the same ultimate temperature) for any given amount of current. On the other end of the fuse action spectrum, there are so-called semiconductor fuses designed to open very quickly in the event of an overcurrent condition. Semiconductor devices such as transistors tend to be especially intolerant of overcurrent conditions, and as such require fast-acting protection against overcurrents in high-power applications. 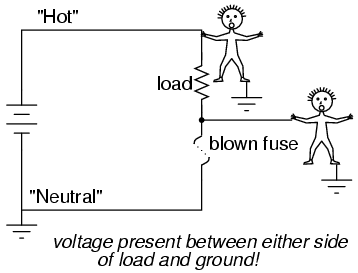 In either case, the fuse successfully interrupted current to the load, but the lower circuit fails to interrupt potentially dangerous voltage from either side of the load to ground, where a person might be standing. The first circuit design is much safer. As it was said before, fuses are not the only type of overcurrent protection device in use. Switch-like devices called circuit breakers are often (and more commonly) used to open circuits with excessive current, their popularity due to the fact that they don't destroy themselves in the process of breaking the circuit as fuses do. In any case, though, placement of the overcurrent protection device in a circuit will follow the same general guidelines listed above: namely, to "fuse" the side of the power supply not connected to ground. Although overcurrent protection placement in a circuit may determine the relative shock hazard of that circuit under various conditions, it must be understood that such devices were never intended to guard against electric shock. 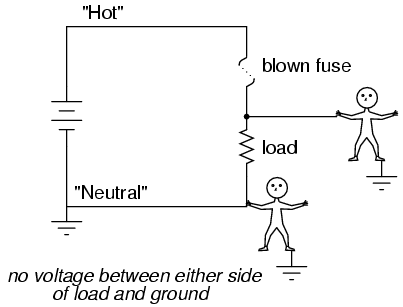 Neither fuses nor circuit breakers were designed to open in the event of a person getting shocked; rather, they are intended to open only under conditions of potential conductor overheating. 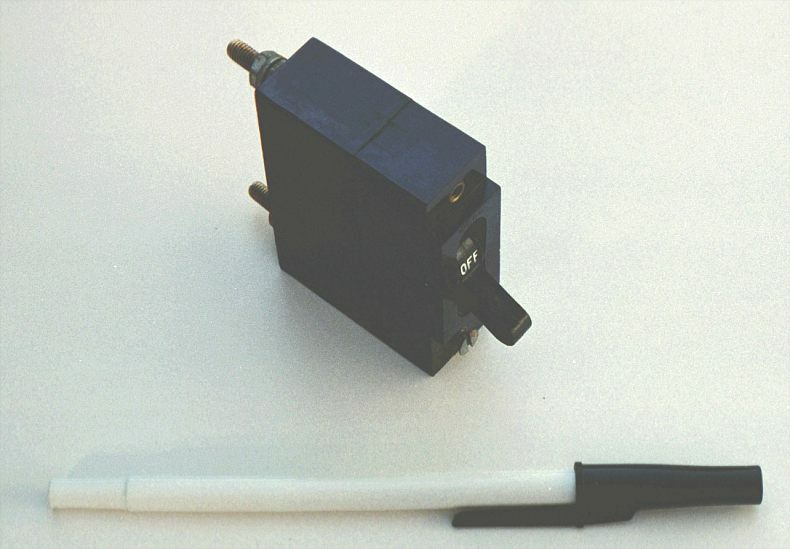 Overcurrent devices primarily protect the conductors of a circuit from overtemperature damage (and the fire hazards associated with overly hot conductors), and secondarily protect specific pieces of equipment such as loads and generators (some fast-acting fuses are designed to protect electronic devices particularly susceptible to current surges). Since the current levels necessary for electric shock or electrocution are much lower than the normal current levels of common power loads, a condition of overcurrent is not indicative of shock occurring. There are other devices designed to detect certain shock conditions (ground-fault detectors being the most popular), but these devices strictly serve that one purpose and are uninvolved with protection of the conductors against overheating. A fuse is a small, thin conductor designed to melt and separate into two pieces for the purpose of breaking a circuit in the event of excessive current. A circuit breaker is a specially designed switch that automatically opens to interrupt circuit current in the event of an overcurrent condition. They can be "tripped" (opened) thermally, by magnetic fields, or by external devices called "protective relays," depending on the design of breaker, its size, and the application. Fuses are primarily rated in terms of maximum current, but are also rated in terms of how much voltage drop they will safely withstand after interrupting a circuit. Fuses can be designed to blow fast, slow, or anywhere in between for the same maximum level of current. The best place to install a fuse in a grounded power system is on the ungrounded conductor path to the load. That way, when the fuse blows there will only be the grounded (safe) conductor still connected to the load, making it safer for people to be around.